Often if we're bored or the weather is reasonable and we need to escape the normal beat of the drum that is life, we hop in the car and drive approximately 50 minutes away to a town called Latrobe: home of the Axeman's Hall of Fame and Anvers Chocolates. mmmmm...Anvers. It's a place that is best visited in the cooler months of the year as they have the fires burning and the hot chocolate pouring. We indulged in our usual fare: Chilli hot chocolate in a large mug for DH and I always keep it simple with a normal hot chocolate served in a chocolatiere. 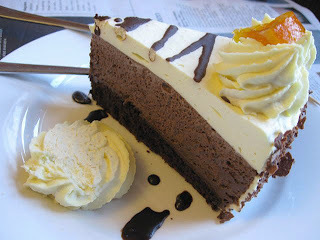 We shared an indulgent piece of Chocolate mousse cake given that it was Father's Day on this side of the world. I took the pic of the cake with my new camera. It's just a cheapie Canon but it certainly takes a decent enough macro shot if I play with the settings a bit. One day I will be able to afford a dslr. One day. Awesome macro-shot. Those are so fun!!! 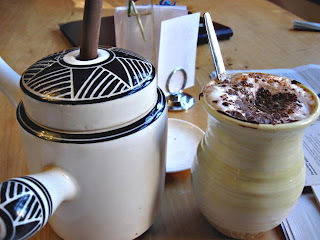 I love places where you can get different kinds of hot chocolate. I'd probably be like your husband and go for the crazy flavors. I like spicy/chili chocolate. Great shot. Oh, and I am practically drooling. Tis yummy indeed. I took the hot chocolate shot too. YUM..now I feel like choc cake. Luigi and I are coming to launi in jan, I will have to put that on our list. Are you coming for a holiday Dani? Yay..someone else to meet up with! Let me know closer to the date and we can meet for coffee and cake :-D Where else in Tassie are you going to go? That'a a great shot...I got a dslr about 6 months ago and I am in LOVE with it. The dessert looks crazy good too!